Let’s start with poetry, and indeed with Poor Rude Lines. Like Josephine Corcoran I tend to err towards blogs about poetry rather than blogs where an individual posts his or her poetry, although I quite like a mix of the two. 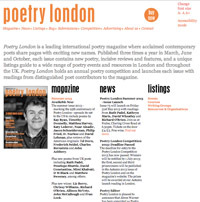 The first thing I love about Poor Rude Lines is that stunning masthead – go on, name all the poets depicted – and John’s use of photos to break up the text and enhance the reading experience. I was immediately drawn into his review of Fiona Moore’s The Only Reason for Time and quickly realised this is a marvellous reviews site, as well as much else. Check out the archives. John also appears to be a high quality Tweeter – worth following. I’m suitably embarrassed to admit I’ve only recently come across Cliff Yates. What can I say? This poetry world is a big ‘un, and I’m but a lowly ant picking my way across its vast acreage. How Cliff finds the time to blog I don’t know, he’s clearly a busy working poet and tutor and his ‘about’ page is inspirational. There’s a comprehensive blogroll, lots of resources for teaching poetry, useful links, details about Cliff’s books, workshops and other activities and yes, some of his poems too. The site is built on WordPress and has a workman-like visual theme, but for me it oozes generosity, warmth and down-to-earth-ness. This is excellent, thanks, Robin. I already follow, and admire, Poor Rude Lines and Cliff Yates’ blog but I didn’t know about Graham Nunn’s blog so I’m looking forward to investigating that. Thanks Josephine – I often learn about new blogs to follow from you, so I expect you’ll see quite a few you recognise! You’re welcome, Charlotte, thanks for commenting. I echo Graham’s sentiment: thank’s for the shout out. Fiona Moore’s collection is superb, isn’t it? Have you read her blog, Displacement? (http://displacement-poetry.blogspot.co.uk) I also enjoy reading Matthew Stewart’s excellent Rogue Strands (http://roguestrands.blogspot.co.uk). Matthew’s posts are well-considered, succinct and always worth reading. Finally, have you discovered Sonofabook (http://sonofabook.blogspot.co.uk)? I shall look forward to discovering yet more excellent bloggers here.